Sam and Remi Fargo, heroes of Spartan Gold, return in this extraordinary new adventure from the number-one New York Times best-selling author. With Spartan Gold, a daring thriller that Publishers Weekly proclaimed "solidly in the Cussler tradition [and] sure to please new fans and old," Clive Cussler introduced husband-and-wife treasure-hunting team Sam and Remi Fargo. In their electrifying new adventure, the Fargos make a startling discovery that others would kill to keep hidden. While scuba diving in Tanzania, they come upon a relic belonging to a long-lost Confederate ship. An anomaly about the relic sets them chasing a mystery - but unknown to them, a much more powerful force is engaged in the same chase. Mexico's ruling party, the ultranationalist Mexica Tenochca, is intent on finding that artifact as well, because it contains a secret that could destroy the party utterly. Through Tanzania and Zanzibar, into the rainforests of Madagascar, and across the Indian Ocean to Indonesia and the legendary site of the 1883 Krakatoa explosion, the Fargos and their ruthless opponents pursue the hunt - but only one can win. And the penalty for failure is death. Listen to another far-flung Fargo Adventure. I enjoyed this story but unfortunately I got the abridged version. I think the story would have been more developed if I had gotten the unabridged version. 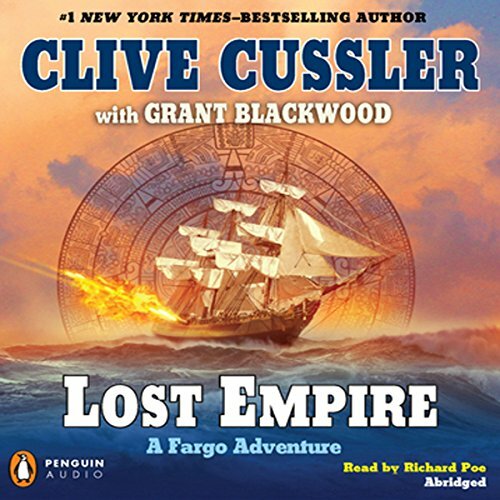 I do recommend this story to people who like Cussler's style of writing. Great book, but a bad abridgment. A good book. My only complaint with this book was the abridgment seemed to take a lot of the story out. I always enjoy the adventures of Sam & Remy Fargo, this one is no different. I did however have a hard time listening due to the narrator. Not a huge fan of this narrator. I began listening with my son who is at that age where reading is too burdensome. The adventure Cussler and Blackwood weave is perfect for that age. Mr Poe's narration included just enough drama to add depth, while not going over the top. Mr. Cussler has moved from fast moving, intriging action and interesting plots to rambling dialogue, history laden prose and a lack of clear connection through the plot. I have many of Mr. Cussler's books and enjoy most of them. Lost Empire is not one of these.